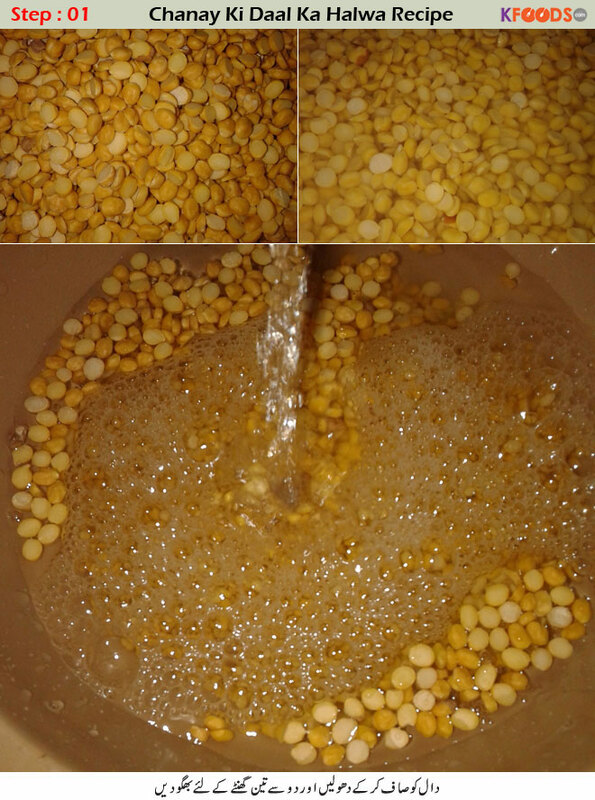 Clean the lentil and wash; then soak for 2 to 3 hours. Now boil the lentil until it is softened and water is dried out. Grind boiled lentil on stone or in a chopper. Grind it to a fine powder. Heat a saucepan and add ground cardamom pods. Once you feel the aroma of cardamom, add ground lentil and mix well. Add half the sugar and mix well. Once sugar is likely to dissolve in the mixture, add ghee and roast very well. Add remaining sugar, cook on medium flame and keep stirring the spoon. While roasting the lentil, add some chopped almonds. 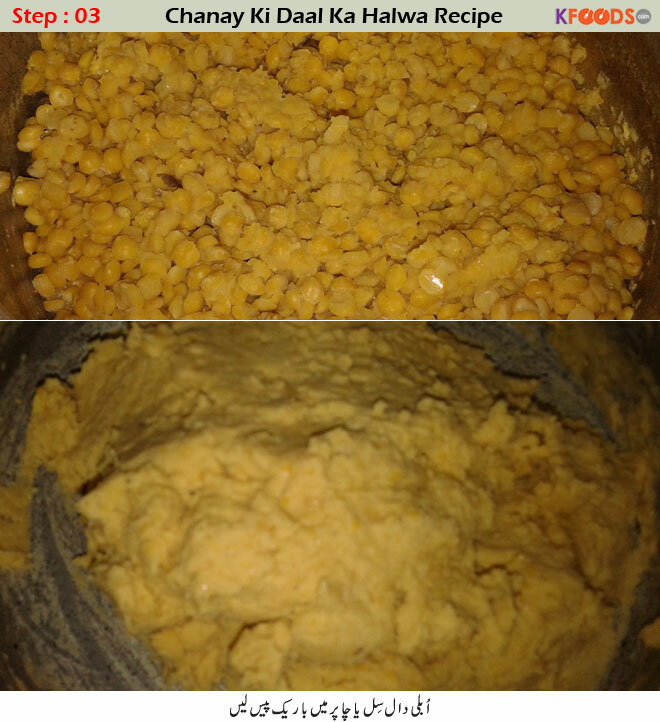 Once you feel the aroma of chana dal halwa, and it tend to repel the pan bottom, halwa is ready. Now we have to solidify halwa. Grease rolling pin, platter and knife with ghee. Add halwa to the platter, and lay across, with the help of rolling pin. Sprinkle chopped pistachio, almonds throughout the halwa pan. Make cuts with knife and garnish with silver paper. Delicious chana daal halwa is ready. Wash lentils and soak in water for nearly 3 hours. Boil soaked lentil in sufficient water in which it may tenderize well and water evaporates. Now grind the lentil finely in a food chopper or on a stone. Heat pan and cook ground cardamom seeds. Once it releases aroma, add ground lentil and mix well. Once sugar looks dissolved, add ghee and remaining sugar. Keep stirring with spoon otherwise it will burn from the bottom. While roasting, add chopped almonds. Once lentil is roasted well and tends to leave the bottom of the pan, and also you see an oil layer starts appearing, solidify it in a tray or platter (Remember to apply ghee on tray/platter, rolling pin and knife). Once halwa is roasted well, spread it on the tray and smoothen with rolling pin. Add chopped almonds, pistachios and silver paper and immediately make pieces with knife while halwa is hot. Delicious chana daal halwa is ready to serve. While roasting halwa, keep stirring the spoon continuously, else it will burn. Cook on medium heat. Chanay Ki Daal (Split Gram Lentil) is an everyday used food item in Pakistan. Other than making it's curry (salan), it can also be used to make a sweet halwa. 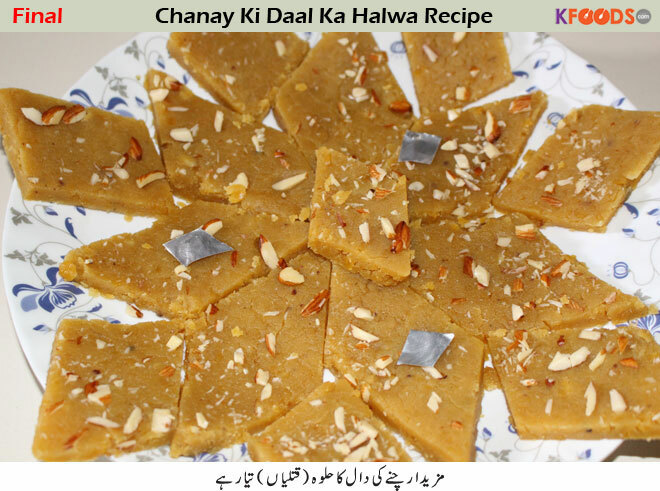 Chanay Ki Daal halwa is a very tasteful, delicious and easy to cook halwa at home. Women of Pakistan often prefer this halwa over other types of halwa recipes in Ramadan, Shab e barat, Eid ul Fitar and other occasions. This is no doubt very tasty halwa. We usually cook suji halwa, aata halwa and this chana dal halwa and we like this one as it is the tastiest one. I also like badam halwa because it is also very delicious. 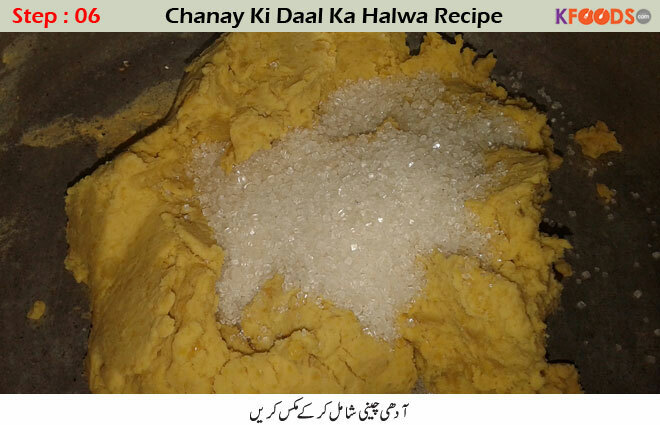 I have always followed chanay ki daal ka halwa (gram lentils halva) recipe by chef Tahira Mateen. She has a great collection of cooking foods and recipes. But now I want more cake recipes but all these are not provided by Tahira so which chef has all these recipes? It is an extremely altogether different and astounding recipe to cook chanay ki daal ka halwa and I am enamoured with its name and taste. My better half and family likewise loved it in particular. 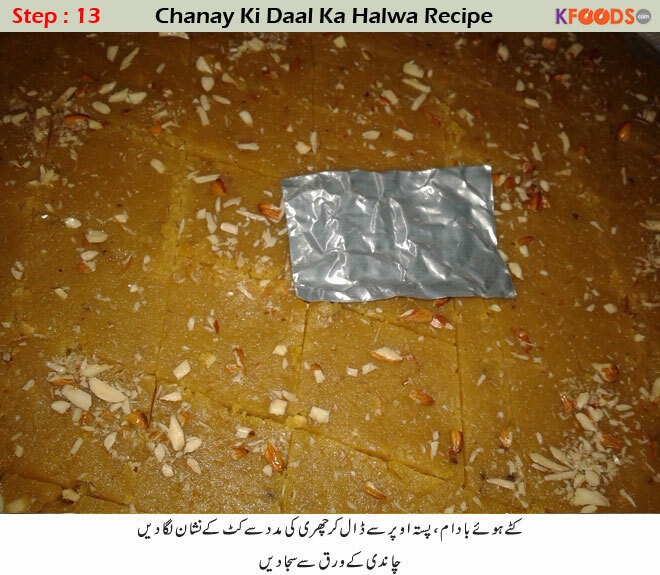 Chanay ki daal ka halwa is an innovative recipe and this is the first time I tried a halwa that looks like a biscuit. So far I am in love with the recipe and taste. The recipe is very easy and quick to prepare. Aha… I have found so many recipes for making halwas of different kinds of halwa here. These recipes can easily be tried for making eid special and enlightening the eid table. I really enjoyed a lot trying this recipe. It was a totally different chanay ki daa I have ever eaten in my whole life. Thank you so much for sharing this outclass and superb recipe. This is my favorite food that I always love eating it. So there are no chances that I won’t try this recipe. Surely, I will must try this recipe. 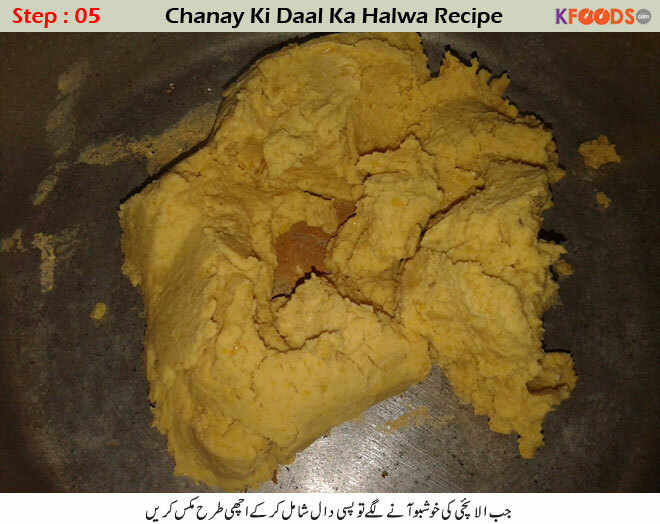 chanay ki daal ka halwa seems a new recipe to me. I don’t even remember if I ever had this dish or not. Well I think I should tell my mother about this recipe. was searching for some desi food recipe for cooking competition in our school. This seem like a different and better recipe as compared to others. 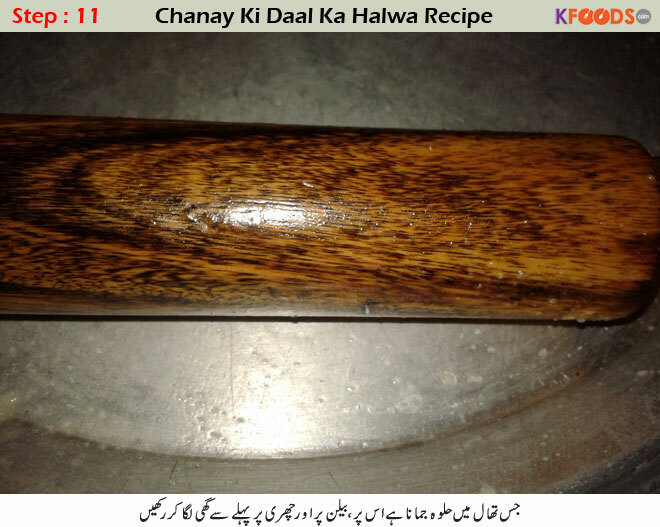 I never ever made chany ki daal ka halwa or I don’t remember ifi ever tasted it. Well this seems a new dish to me and scrumptious one too. wow this is a good idea to make the pieces of halwa. Before this , when we made chana daal halwa, we didn't make its pieces, just eat it with spoon as we eat any other dessert. So this is a good thing, we will follow it. It looks very easy to make especially its ingredients are very easy and always available in the kitchen. Now look it needs chana daal, and it is there at home, i would make it easily. 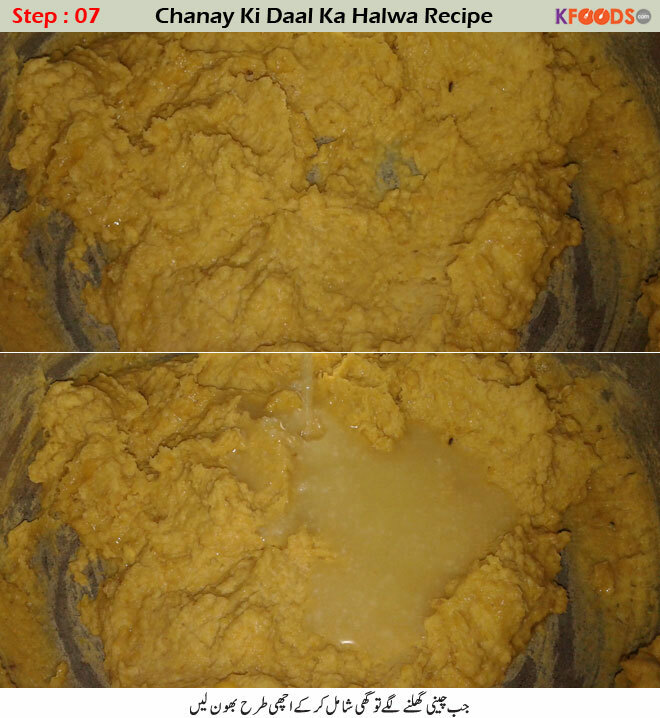 This was my first ever attempt to make daal ka halwa. I didn’t knw the way to cook it before then I followed your recipe and made it so easily with its help. chana dal is used for many many things. I shop at least 2 kg of chana daal and then I make shami kababs, chana dal gosht and chana dal halwa with it. i would like to suggest you to use it for as many recipes as you want. Woo, i have lot of pulses including bengal split gram (chanay ki daal) and I have stored it as we buy grocery for whole month. Now I can make it surely . Just understanding the recipe and will start making it tonight. Looks very delicious , specially when you spread it across the platter and smoothed using rolling pin. I would make it and I would also garnish it with silver paper but I would make it in less quantity because I live alone with my two kids. tasty halwa, my favorite , always make this halwa on the occasion of shabe mairaj and sometimes without any occasion. Chana dal halwa is not only easy to make but also tasteful enough that everyone likes it including children. 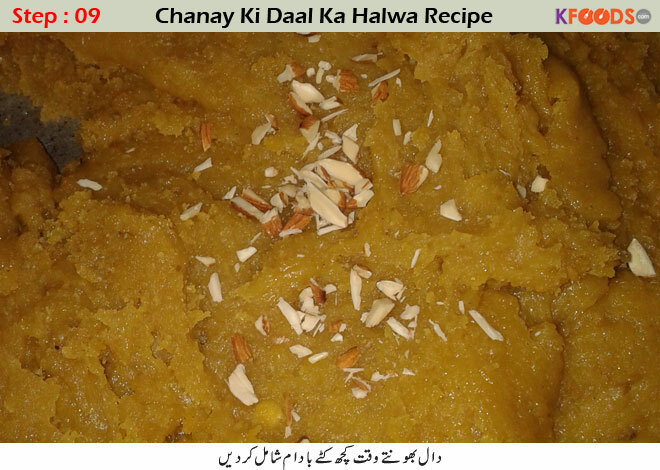 I am making chanay ki daal ka halwa, it is a nice recipe that is always a choice of my kids. I also several other kinds of halwa recipes because I personally like sweets. i am going to try it today INSHA ALLAH dua karain acha banay I am sur app ki recepies achi ho ti hain per mujh say achi ban jayay AMEEN:). Assalam o Alaikum, mai ap ki tamam step by step recipes boht shoq se parhti hun or phir us me se jo mujhe pasand ati hai wo mai banati bhi hun. mai kfoods ki boht sari recipes bana chuki hun . boht acha taste ata hai or sub ghar walon ko pasand ata hai. 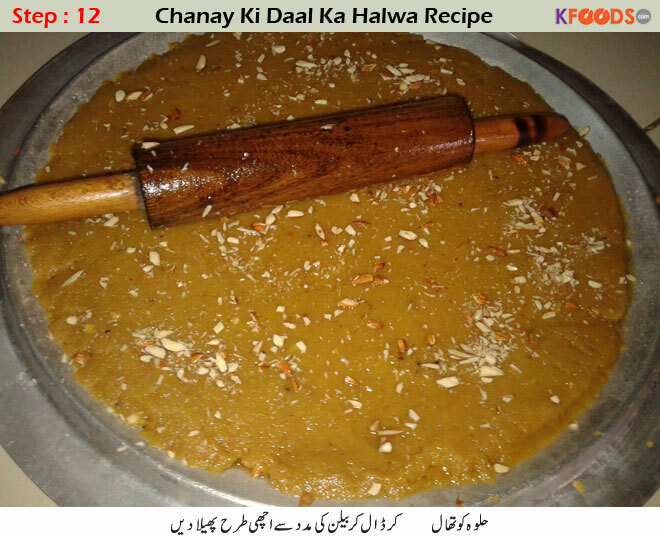 Read Blog about How to Make Chanay Ki Daal Ka Halwa Recipe and health & fitness, step by step recipes, Beauty & skin care and other related topics with sample homemade solution. Here is variety of health benefits, home-based natural remedies. 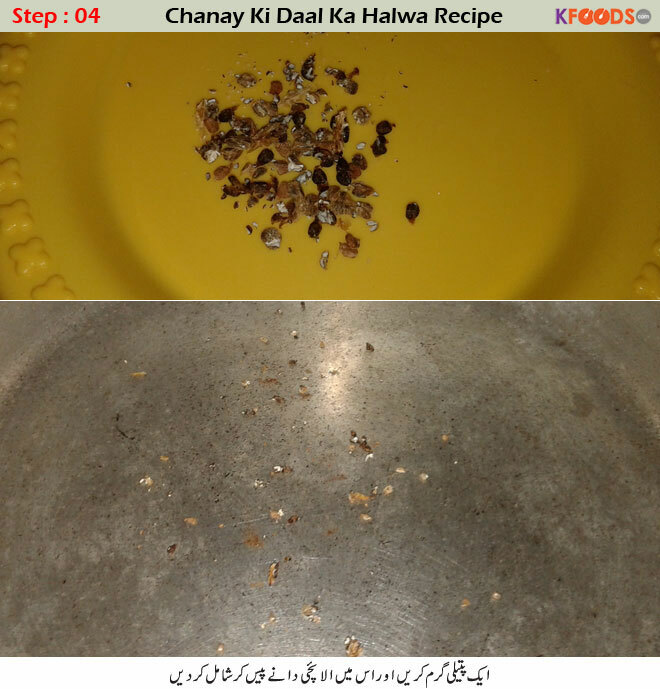 Find (How to Make Chanay Ki Daal Ka Halwa Recipe) and how to utilize other natural ingredients to cure diseases, easy recipes, and other information related to food from KFoods.